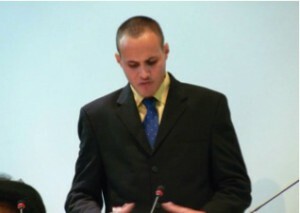 On 19 February 2013, Grenada’s youngest politician, Ali Anthony Brian Dowden, failed in his attempt to defeat Grenada’s most experienced politician, but scored a double personal victory as he became not only the country youngest to contest the General Election but celebrated his 21st Birthday on that day battling to become a Member of Parliament. Born in the village of Mt. Moritz, to parents Helen Dowden and Neville Griffith, Ali’s life was in some ways not as easy as the life of his peers. In 1998, at the tender age of 6, he lost his father and in 2005 at the age of 13, watched his mom put to eternal rest. “I had a rough life growing up,” he said. Dowden speaks of having to struggle to get to where he is today — at St. George’s University. With the love and support from his family, in particular his Aunt Joslyn Dowden, who nurtured him in the absence of his parents, Ali grew up to take his place in society. The younger of two brothers by mother, Ali presently lives in Mt. Moritz with his brother’s sister Nella Medford, whom he refers to as his adopted mother. For as long as he can remember, Ali provided voluntary services to community and country. At the age of 18 Ali became President of the Grenada National Patient Kidney Foundation, a post he still holds and also serves as a volunteer at the Grenada Cancer Society and the Friends of the Mentally Ill organization. 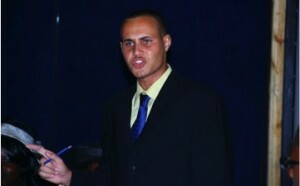 However getting involved in politics was “a roller coaster ride” for Ali who told Media Studies student, Cherrian Blackman-Stephen in an interview on 26 February 2013, that he had to exercise extreme patience, cover up a lot of his true feelings, and constantly check his friends as well as what he says and does. Having had early roots in this country’s oldest political party — The Grenada United Labour Party (GULP) in 2010 which he served as Financial Secretary, Ali left that party in 2012 after Collin Francis the then interim political Leader of GULP who asked him to join the party walked away. Dowden said leaving the GULP was made even easier due to on-going infighting within the party and its humiliating defeat at the polls in 2008. He then joined the National Democratic Congress (NDC) at the invitation of members of the NDC Constituency Branch and in late 2012; his candidacy for St George North West was announced. Ali faced a David and Goliath situation as he was going up against Grenada’s most experienced politician, Opposition Leader and three-time former Prime Minister, Dr. Keith Mitchell. Ali’s limited political experience which includes his participation in the country’s Youth Parliament in various positions including as Prime Minister in 2011, Leader of the Opposition and Minister for Youth and Sports in 2012, the budding politician intends to remain a full-time politician. He says that he will remain a member of the defeated NDC as they strive to rebuild the party and prepare for the 2018 General Election. The defeat at the hands of Mitchell for the St George North West Constituency — NNP 2,679 to NDC (Ali’s) 323 is no deterrence for Ali as he continues to bring young vision to the people of North West. Trying to balance his political career with his studies and being a young man, with the election behind him, Ali’s focus is to catch up with a full week’s missed lessons as he prepares to complete the last year of his University level education at the St George’s University (SGU). 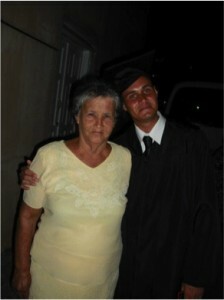 In December of this year he looks forward to graduating from SGU with his Degree in Business Management. His accomplishment with very little money to rely on at the end of each semester is another testament of his will to succeed with only his faith in God to see him through. Ali plans to pursue his Masters online in Leadership thereafter. As far as his personal life is concerned Ali has made numerous acquaintances mostly friends from the opposite gender. He said that while this is a good thing it can also be very distracting and he has had to manage those attractions. Ali said that his involvement in politics stemmed from his love and passion for people. He further explained that because of past personal experiences in his life he chooses to dedicate his life to the will of God and provide yeoman service to humanity. He sees politics as an opportunity to serve people on a larger scale. He also believes that his involvement in politics creates an avenue of hope for young people. In an interview with veteran Broadcaster George Grant earlier this year, Ali told Grant that he was motivated by the fact that Grenada’s political landscape had no young people between the ages of 20 to 30 actively involved in frontline politics and running for office. He felt that he could give his peers throughout the country, a voice they did not have and a sense of hope. Animosity, that Ali learnt first-hand during his campaign, as loyalists to the New National Party (NNP) and Keith Mitchell threw stones at him while on the campaign trail. In one instance a supporter had a bucket of stale urine (pee) waiting to throw on the young politician as he sought votes from constituents. In a highly politically divided country Ali’s mindset is to unite the people through education and inclusion. Guided by the desire to unite the people of his constituency regardless of political affiliation, Ali has the right formula to secure sustainable development for the constituency and promises that “Win or lose you can all count on me… I will remain on the ground”. Ali knows first-hand about discrimination. Part of his personal emotional struggle was living with the knowledge that his mother was mentally ill and therefore could not take care of his needs as they both would have liked. During his political campaign there was also talk about him being mentally unstable. Growing up, it was Ali’s dream to become a teacher and later a businessman, but having attended Mt Moritz Pre and Primary Schools, The Grenada Boys Secondary School (GBSS), The T.A. Marryshow Community College (TAMCC) and now the St George’s University (SGU), Ali choose to take a full bite of politics when the opportunity presented itself. Dowden said that it’s his life’s purpose to serve his people and asked for a fair chance from the electorate. He is hopeful that Grenadians will work along with him, as he’s young and welcomes guidance from the people. His slip from becoming a member of parliament did not erase his vision to create a Centre of Excellence for innovation and enterprise in the constituency; Develop an industrial park for Grenada, specialising in vocational courses and Information Technology (IT); Design and implement a housing repair and building programme across the constituency, employing the labour of constituents; Construct a Pre-School for Grand Mall; Develop a non-partisan ‘Constituency Council’ where residents meet to identify pressing constituency issues and develop solutions; Modernise community centres, outfitting them with gyms, kitchens and homework areas; Facilitate a boat departure point to Petite Martinique from St George North West; Develop a music programme in the constituency to diversify the training experience; and Establish a scholarship fund to help needy children with tuition. With little political experience, his educational background, and the will of God, Ali hopes to accomplish people-centred development through education within his constituency. Despite his young age, Ali Dowden has demonstrated strength of character by taking on the challenge of leading St George North West on a path of progress to work with constituents to develop and implement policies that respond to the needs of all. The increased use of technology will also be a feature of this mission to transform the constituency into an area that promotes the development of small and medium enterprises and increase St George North West export capacity. He envisions an economically stable and united community that focuses on people-centred development and capitalises on the innate talents of its people to reduce poverty and raise the standard of living of all constituents. Community engagements include the establishment of a thrift store at the Grenada National Patient Kidney Foundation, earning well-needed funds for the Association. He has made contributions to four pre-primary schools including his alma mater, Mt Moritz, Brizan, Happy Hill and Grand Mal pre-Primary Schools. He is a volunteer with Friends of the Mentally Ill and is in the process of raising funds to construct a new roof for the Happy Hill Pre-Primary School.Dowden considers himself approachable and community-spirited. He is guided by the philosophy that ‘it takes a village to raise a child’ and is not afraid of challenges, as exemplified by his vying for the seat controlled by one of Grenada’s most experienced politician. One of Ali’s former lecturers at the T.A. Marryshow Community College (TAMCC) who preferred to remain unnamed recalls the young politician as a regular teenager, ambitious, eager to learn and is never afraid to speak his mind. He believes that Ali has a bright future in politics and could become Grenada’s future Prime Minister, however is concerned that Ali may have become involved in frontline politics too soon and as a result could be crushed by the more experienced ones after the election is over. His encouragement for Dowden is to focus on his studies at this time and read a lot. As a practising Christian, Dowden said that his church family has been very supportive towards his pursuits in politics, although they will not encourage Christians to become involved in politics. He believes that while the church strives to assist the people throughout the country there is a lot more to be done. 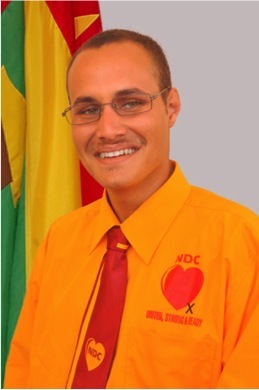 Despite some people’s belief that Ali does not stand a chance against Prime Minister Dr. Keith Mitchell, one thing is for certain, Ali Anthony Brian Dowden was defeated but not destroyed; he has created political history in Grenada; and his political legacy is just about to take shape under the banner of the National Democratic Congress.